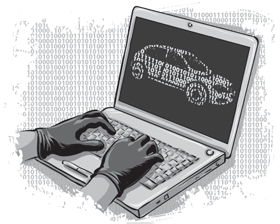 Computer geeks already knew it was possible to hack into a car's computerized systems and finally, two U.S. hackers - Charlie Miller and Chris Valasek, sponsored by the Pentagon's research facility DARPA recently demonstrated just how easy it is for malicious hackers to physically hijack a modern car using a laptop. Feeling exiting ... ? You should worry too..It's all very concerning. Because you may never drive your car again after you see how a couple of government funded tech guys were able to hack into, and take control of car’s steering, dashboard, and even its brakes. Forget hacking accounts, computers or mobile devices, this new threat to our vehicles is thanks to the evolution of electronic control units being installed in most new cars. Charlie Miller, a security engineer at Twitter, and Chris Valasek, the Director of Security Intelligence at IOActive received an $80,000 grant from the US government in order to research these new vulnerabilities. By connecting an Apple MacBook to the car's OBD-II (On-Board Diagnostic System) port below the dashboard, they were able to trigger a series of minor and major events that could annoy drivers at best and cause a serious accident at worst. Minor hacks included manipulation of the car's fuel gauge and speedometer, triggering the seatbelt pre-tensioners and sounding the horn. A video of their demonstration from Forbes, shows them using their electronic access to disconnect brakes, scramble a speedometer, wobble a steering wheel and blast a horn, inside a 2010 model Ford Escape and Toyota Prius. That study showed that the engine control devices initially designed for pollution reduction had been integrated into other aspects of a car's functioning and diagnostics. But security research is notoriously difficult; the fact that Toyota’s engineers haven't found any security vulnerabilities doesn’t mean there aren't any.